Rummaging through my 33 year collection of New Age Journals, some preceding my discovery of the New Age Movement which I purchased at local New Age outlets, I found the following. Mr. Creme then claimed that the figure he was promoting was a fully adult man living in a modern city in the world. He did not out with his London story until five days after our first radio debate in May, 1981. At that time, Mr. Creme was more than startled that I had rightfully tied him to the larger New Age Movement. I have been reviewing my library and duplicate papers that were returned to me from University of Michigan, Bentley Historical Library reviewing and archiving of same. I had not seen these earlier ads which predated my discovery of Benjamin Creme and his mission, but I have reproduced three of several ads in my collection of New Age Journals. A variety of ads announcing the various speaking engagements Mr. Creme would be undertaking were listed on this ad. One of them was even in my home town of Fort Wayne, Indiana. This was prior to my hearing Benjamin Creme speak in Detroit on November 4, 1981. I thought you might find it interesting, and this should serve to exonerate the young Pakistani man. RAJ PATEL, that many think was Creme's candidate. Raj Patel would have been a 9 year old child in 1981 -- not a "mature adult." Thought you might find this interesting. Stay tuned! BLATANT LGBT ASSAULT ON FIRST AMENDMENT RIGHTS BY HOUSTON, TEXAS MAYOR! Just when you thought things couldn't get much worse, now they have. 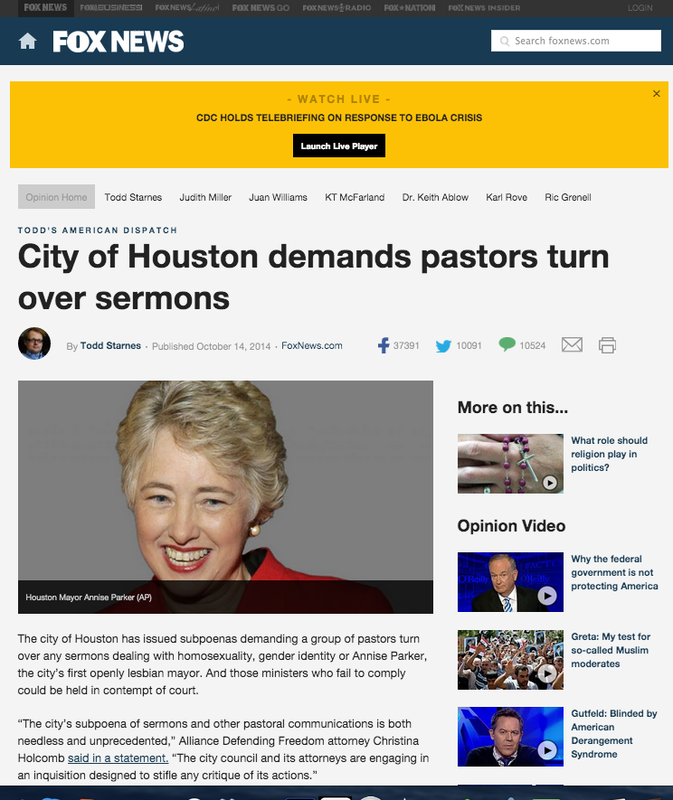 The openly lesbian mayor of Houston, Texas, Anise Parker, has issued a subpoena demanding that local pastors turn over their sermons to her. This is nothing short but an abuse of power -- her power as mayor, the power to use the subpoena process system -- not to mention the clear and unambiguous provisions of the United States Constitution relating to cherished freedoms of speech and religion. It's open season on us now. Now is the time for the ACLU to prove it is really for free speech and religion and step up to the plate to challenge this! Let's see what they do!